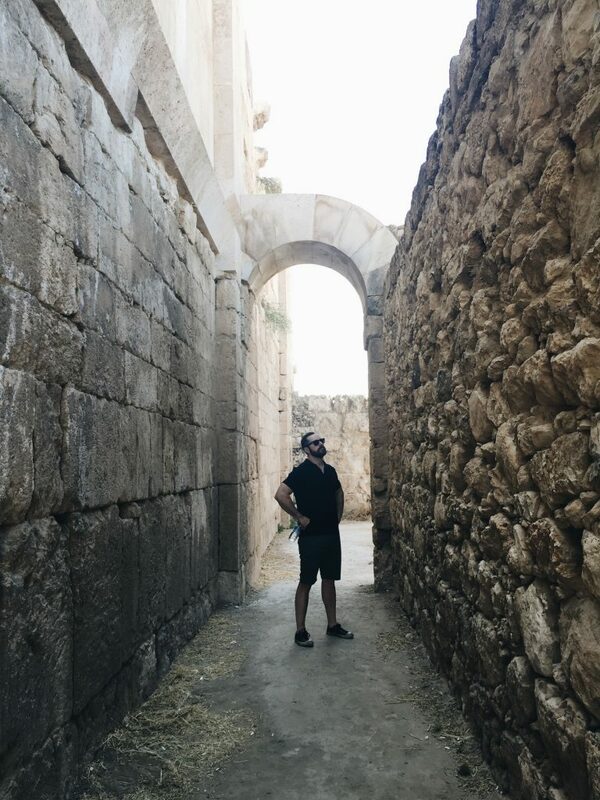 Living in the United States, the Middle East these days isn’t exactly the it summer vacation destination, but I’m here to tell you in this four-part blog series recapping our recent trip to the region that it is well worth keeping on the table. 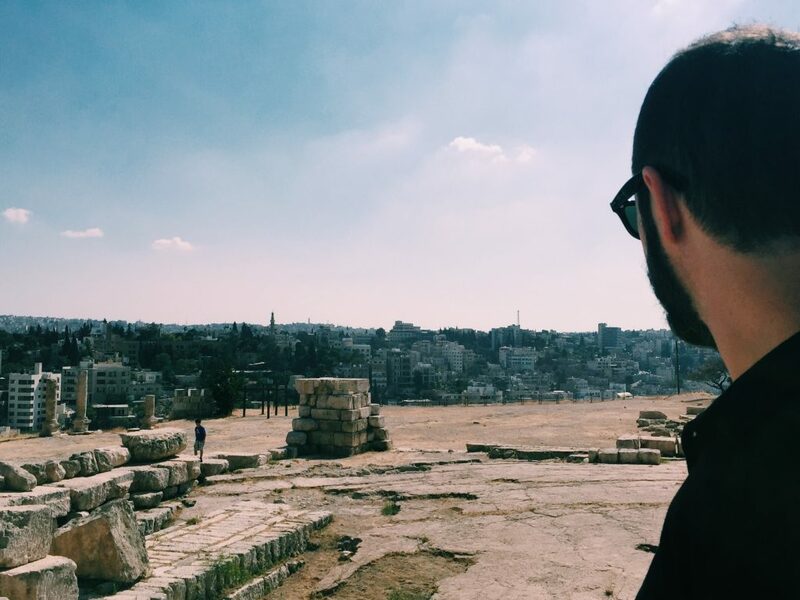 I’m a little biased when it comes to journeying to the Holy Land. 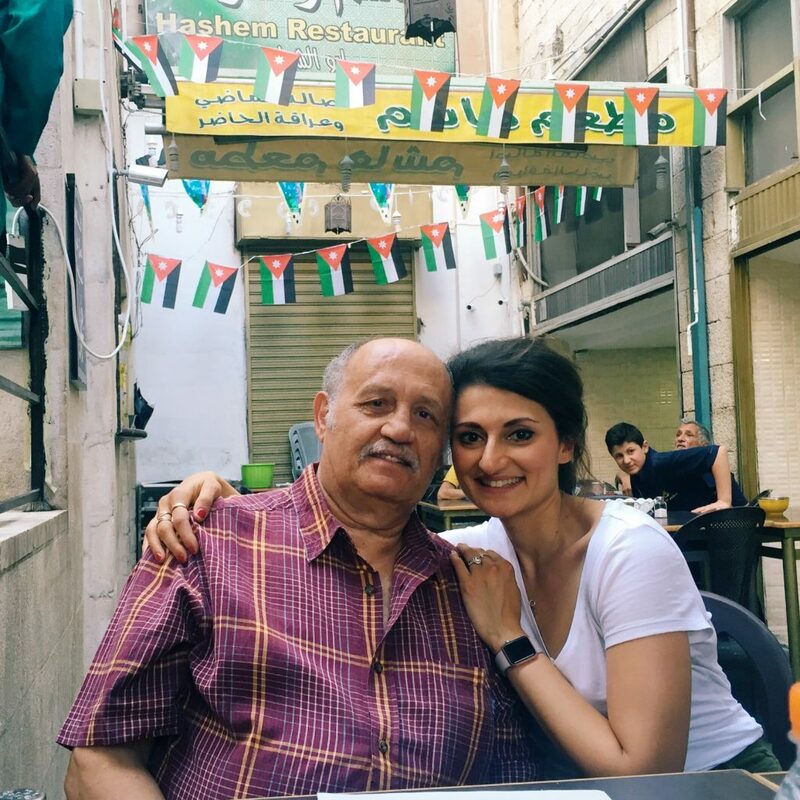 Both of my parents were born and raised in Jordan, and I’ve visited nearly 10 times since I was an infant, but haven’t been back to visit in a little more than 10 years. 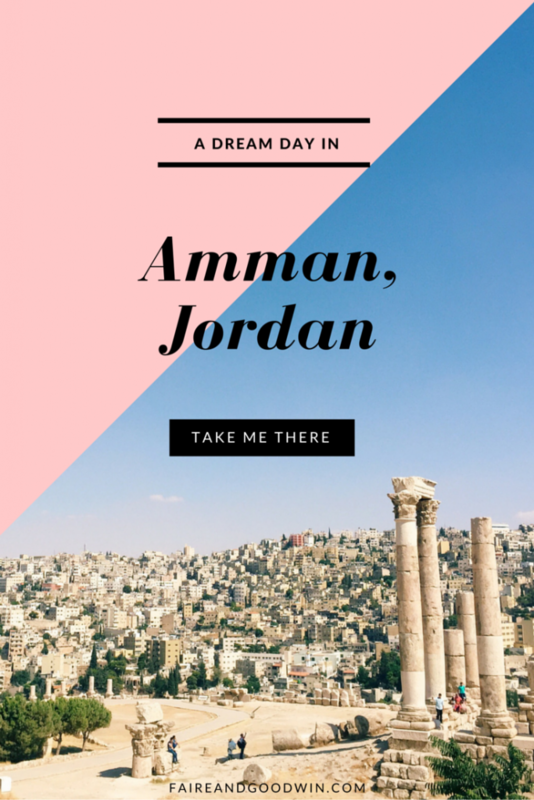 That all changed for me when my brother got engaged to a fabulous woman in Jordan and the wedding being planned for the capital, Amman. I was overjoyed for my brother, and also because I would get the chance to visit my family’s homeland once again. 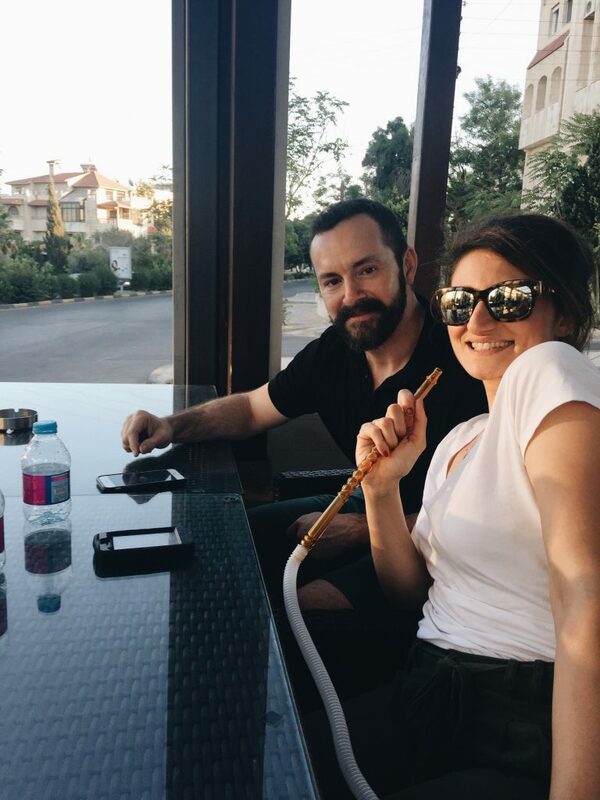 Best of all, I’d get to share the experience with my husband, who had never been to the Middle East, so exploration was high on the list. 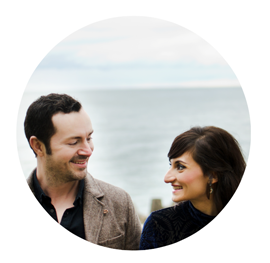 Jody and I searched the internet for months for the best deals on flights and accommodations and eventually decided to take a flight from Toronto (which was $800 cheaper per ticket than flying from Cleveland – thanks Google Flights!). 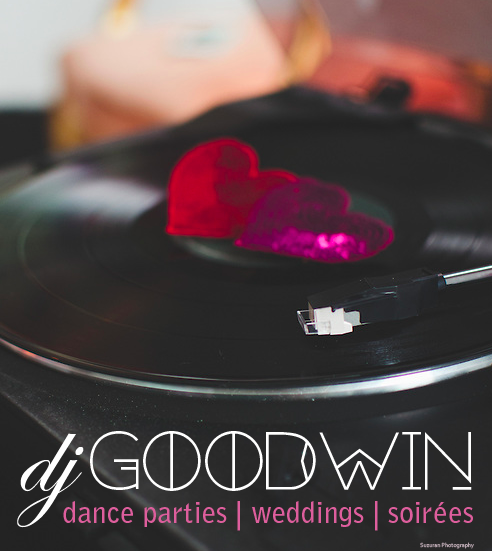 The night before we left, we DJed a wedding, set our alarms for 7 a.m., and hit the road for Canada with Jody’s mom who joined us from Dallas. It was a five hour drive to the airport, six hour flight to London on Air Canada, and five hour flight to Jordan on British Airways. By Monday at 11 p.m., we had arrived! My uncle and mom picked us up and we sat in traffic all the way to dinner. It was still Ramadan, so the city was full of nightlife even at a later hour. 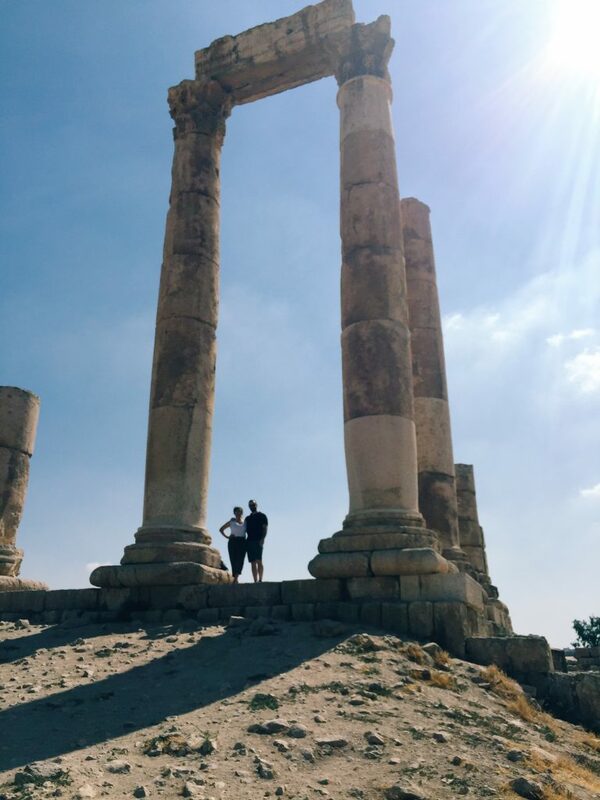 The next day, we set out for a visit to the ancient ruins of the Amman Citadel and Roman Amphitheater, followed by a little shopping and nibbling downtown now that it was Eid (the conclusion of Ramadan)! Entry to the Citadel cost only a few Jordanian dinars, and you can get access to the Roman, Byzantine, and early Islamic ruins that sits at the top of Jabal al-Qala’a. 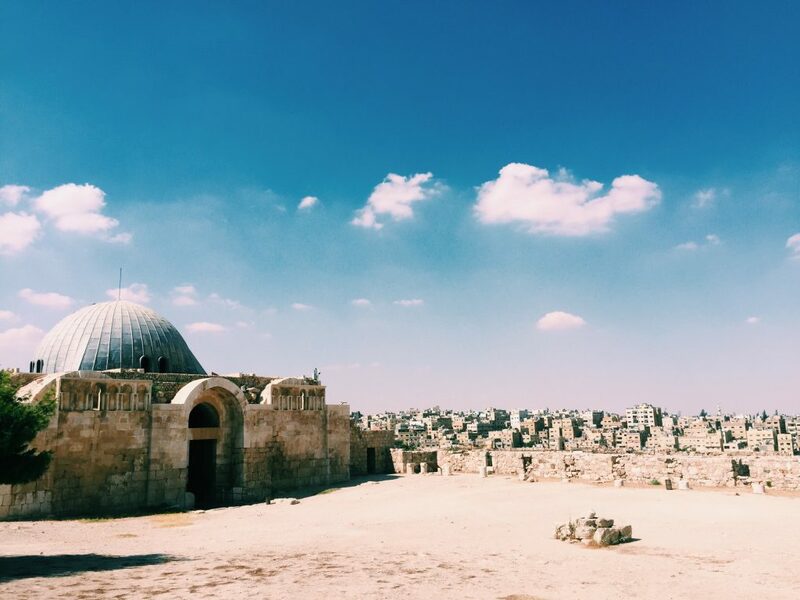 Not only are the artifacts still extraordinary, but so are the views of Amman! 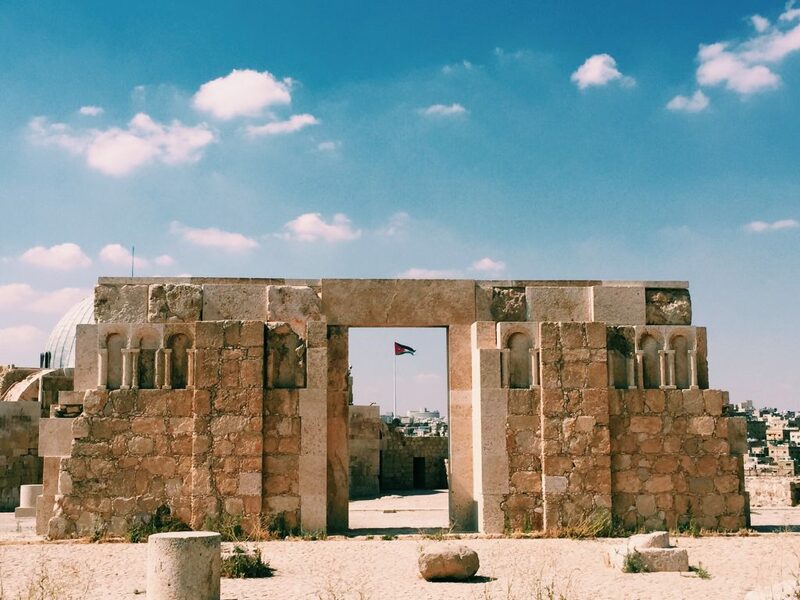 The Jordanian flag is massive and can be seen from almost anywhere in the city! Another look from the top of the mountain. That amphitheater in the middle is where we went next. Beautiful, right? 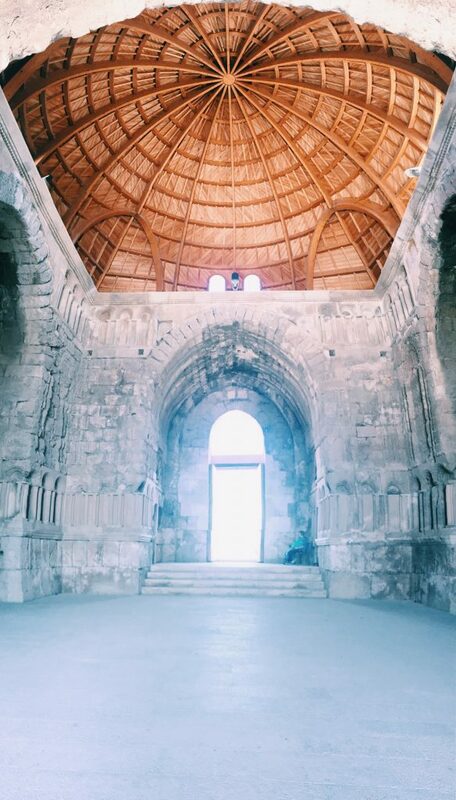 If you’re planning a trip to see the Citadel as well as the Roman Amphitheater, I highly recommend that you tour the Citadel first. It’s much easier to walk down the mountain to the Amphitheater than it is to walk up it! Taxis also wait outside to take you down the street if you prefer, too. 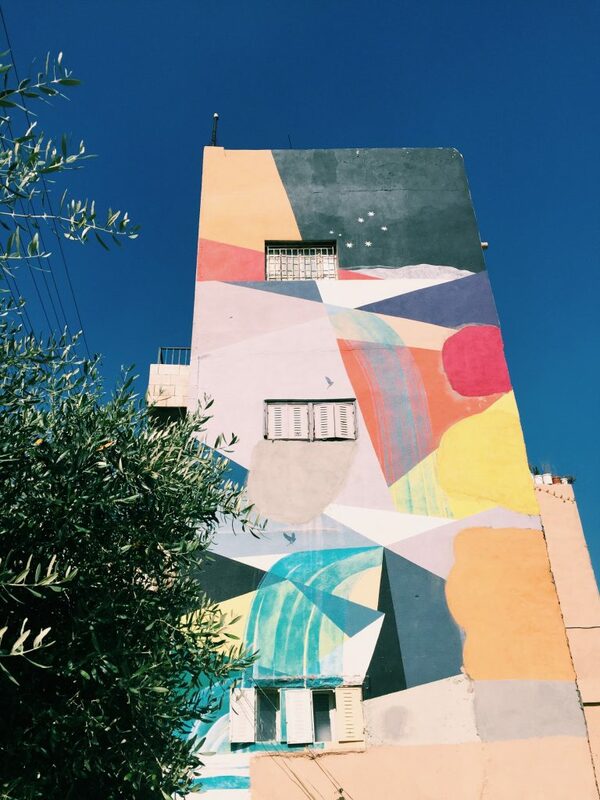 A colorful mural behind a staircase leading literally downtown to the Roman Amphitheater. 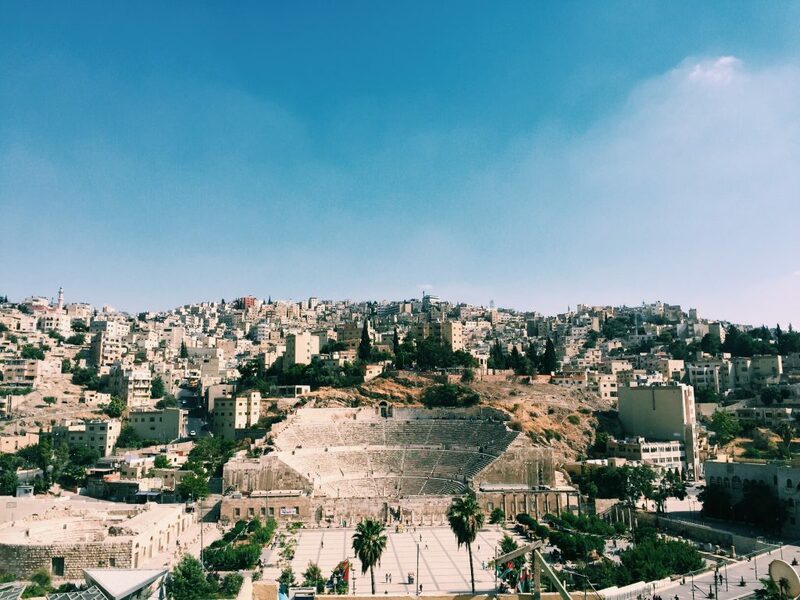 Fifteen minutes later on foot, we arrived at the Roman Amphitheater of Downtown Amman. While its viewable from many places within a couple kilometers, there is a small fee to go beyond the walls and into the amphitheater when there isn’t a ticketed concert or performance. 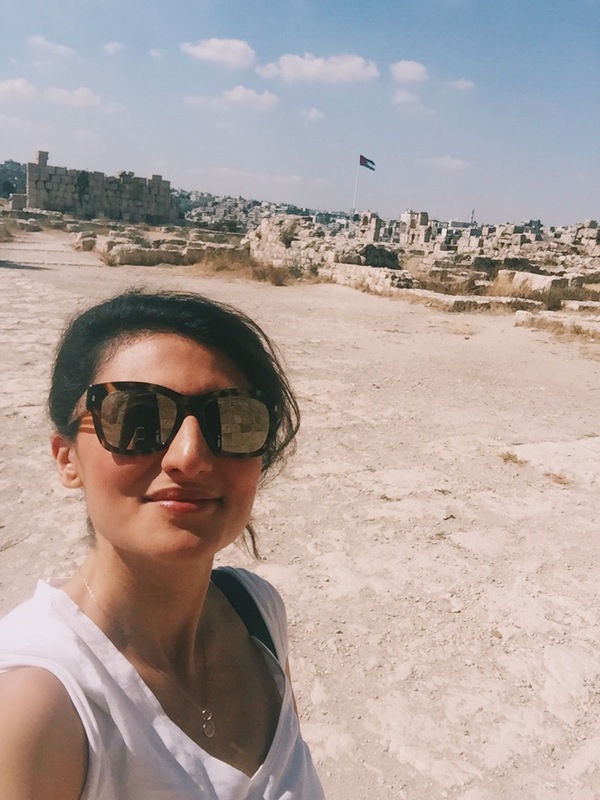 For Jordanian citizens or those carrying a Jordanian ID, it is rarely more than 1 JD to tour any of the country’s ancient sites. Those carrying foreign identifications or passports will pay more (in the case of Petra, which I’ll talk about in a future post, foreigners pay 50 times more). Tickets to the amphitheater also includes admission into the adjoining museum (which, praise God, is air conditioned). How about our new selfie stick?! 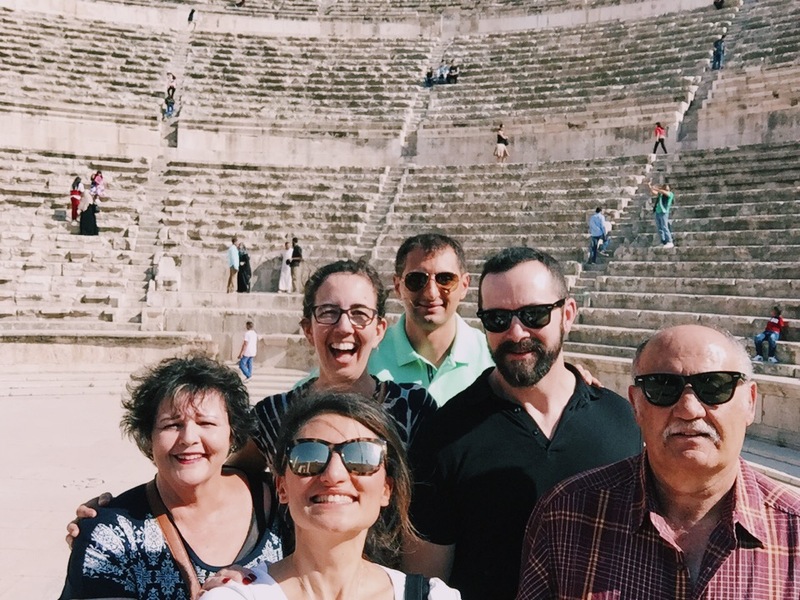 My mother-in-law, me, Kathryn, Raed, Jody, and my dad at the Roman Amphitheater. Better than sharing the meal was sharing the time with our family and friends, especially my dad. I know it’s only food, but I could see in his eyes just how nostalgic he felt being back at one of his favorite restaurants in his hometown, which hadn’t changed in the six decades it’s been open. After Hashem, we were ready to walk off our meal with a little shopping! While Jordan is not the most economically fit city in the region, goods are more expensive than you’d think. 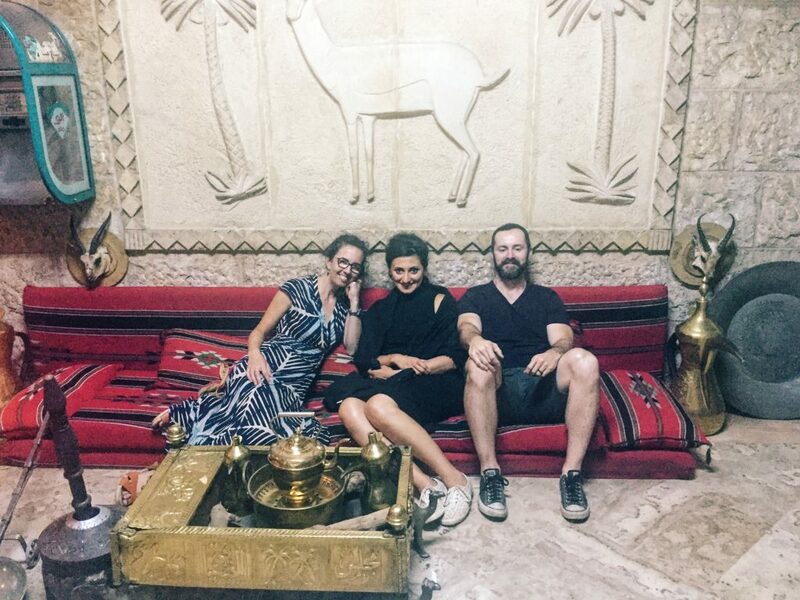 At the time of our visit, one JD was the equivalent of $1.40 USD, but you can stretch it a little farther if you spend your money downtown instead of a suburb like affluent Abdoun (a favorite of expatriates). Afternoon traffic and prayers in downtown Amman near the King Hussein mosque. 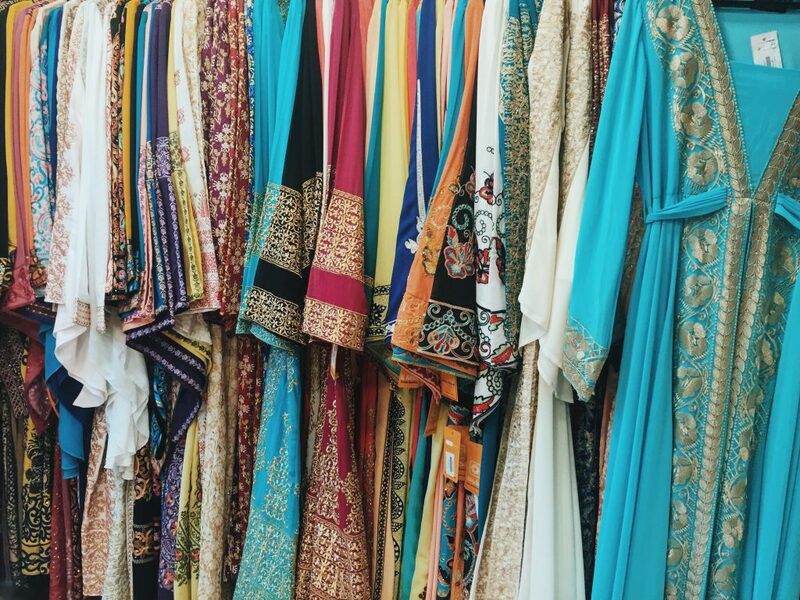 At the outdoor markets downtown, traditional clothing stores as well as homeware and flashy fabric shops line the streets and alleyways, almost reminiscent of New York’s bustling Garment District. 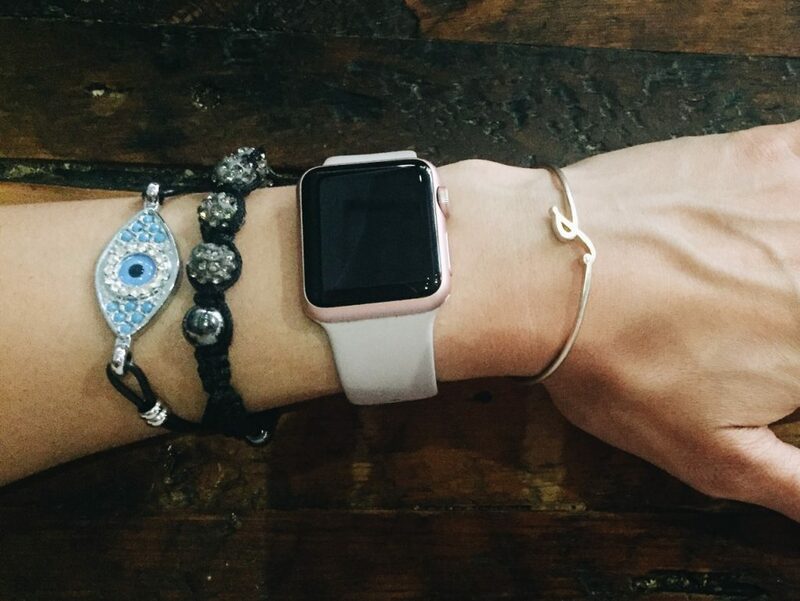 Back on the main road, you’ll find everything from bling to baklava to satisfy both your gold tooth and your sweet tooth. 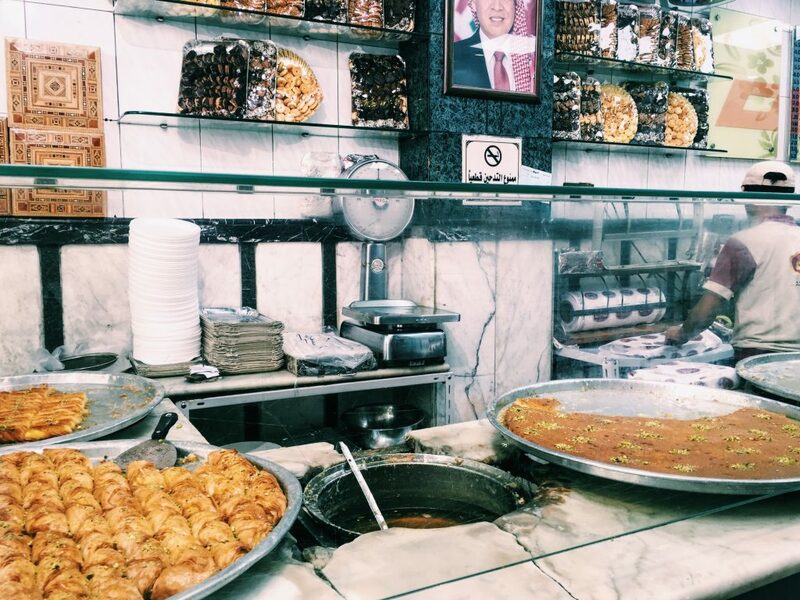 Though Jordanian sweets aren’t really my thing, a stop in Habiba Sweets (above) is a must in Jordan. I love me some baklava and basically anything with rose water in it, but kinafa (pictured at right) is just not my jam. It contains two layers of filo dough with ricotta cheese sandwiched in the middle, covered in spoons of pistachio and hot sugary syrup. It’s a little too rich for my liking, but the ice cream (particularly the mastaka/ashta variety, below) is the stuff I dream about it. 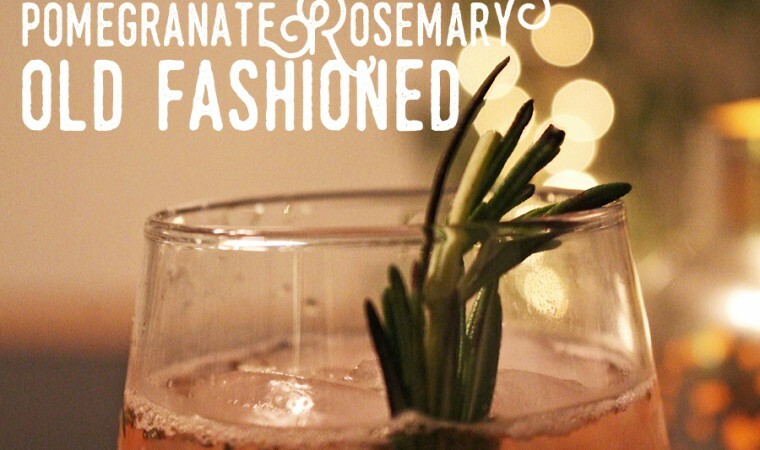 It tastes like gooey vanilla bean-pistachio-rosewater goodness. If you haven’t had it, you must try it. 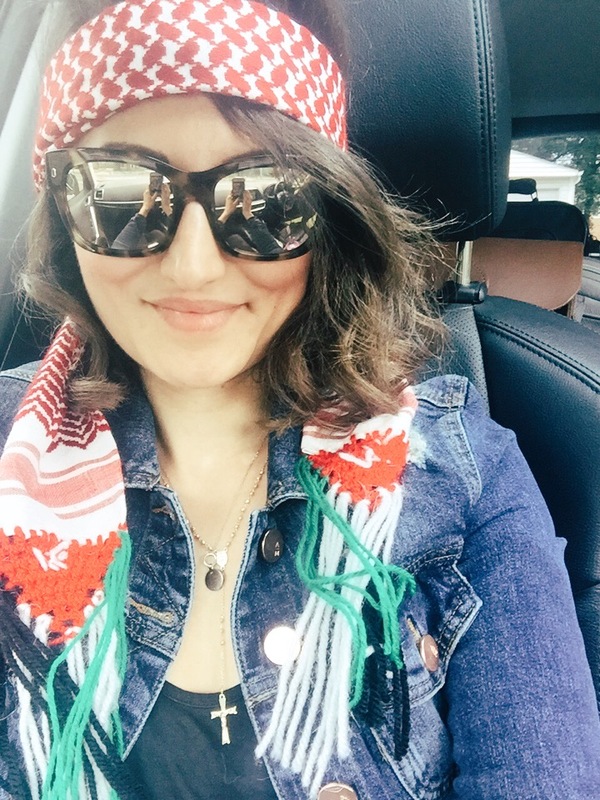 I’m going to figure out how to make it, because the only place in the U.S. I’ve ever had it is in Dearborn, Michigan, where they have a large Arab population. 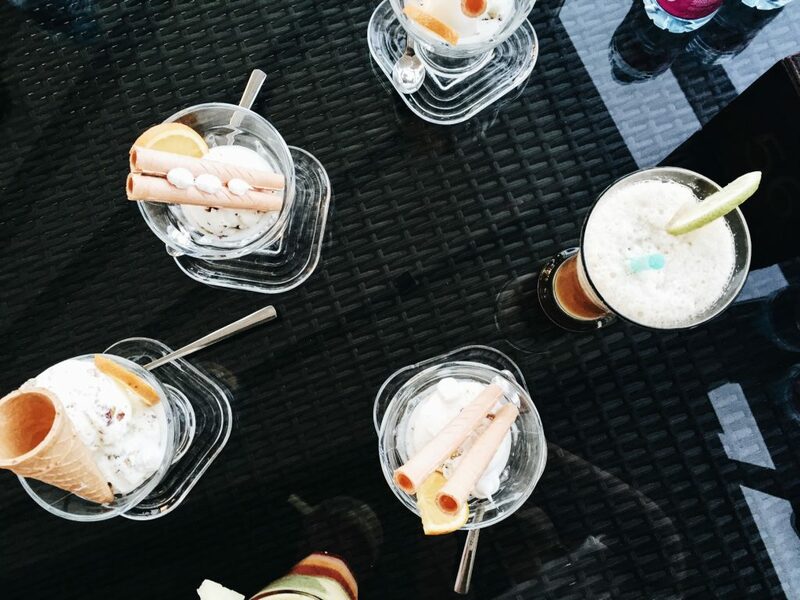 There is nothing like having an ice cream and a shi-sha (flavored hookah) after a long day! I’m not a smoker, but I love a good lemon mint shi-sha. If the 70% of Jordan stopped smoking cigarettes and started smoking these instead, I would have been less cranky. 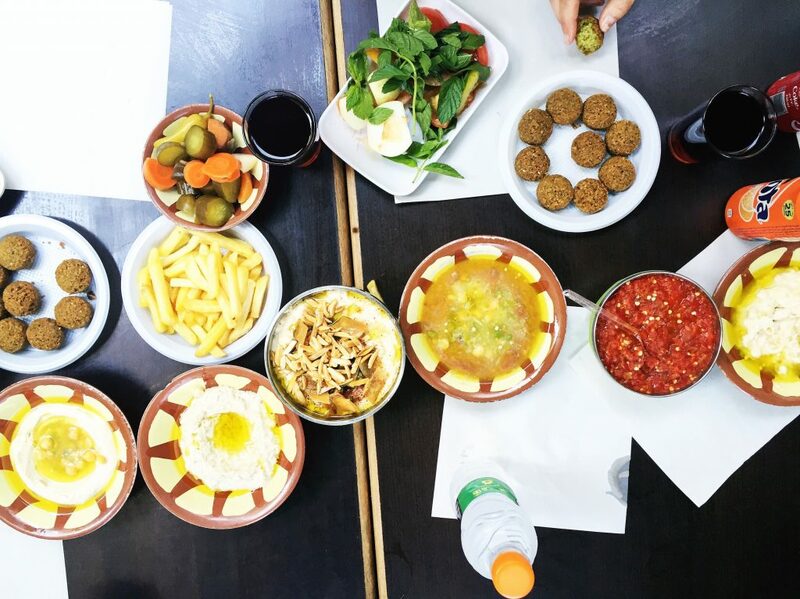 Another must-try in Jordan is the famous Reem Al-Bawadi restaurant. 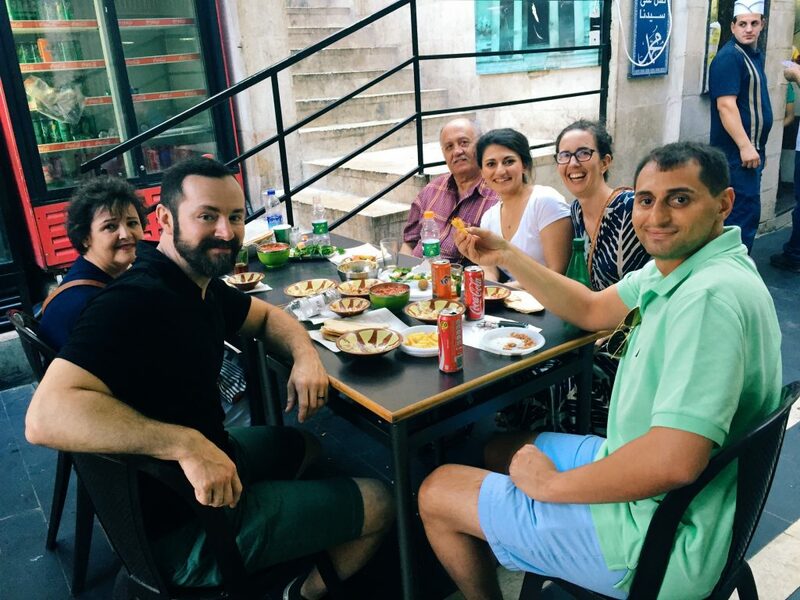 Unlike Hashem, “Reem” has a full menu of delicious Middle Eastern foods to choose from, from fresh salads, to whole fish, grilled chicken and lamb kebabs, and even fried lamb brains (which was indeed ordered for our table). Along with the food, the service and bedouin-inspired decor was excellent. This was just the round of appetizers (and I wonder why I sometimes have issues with portion control!). 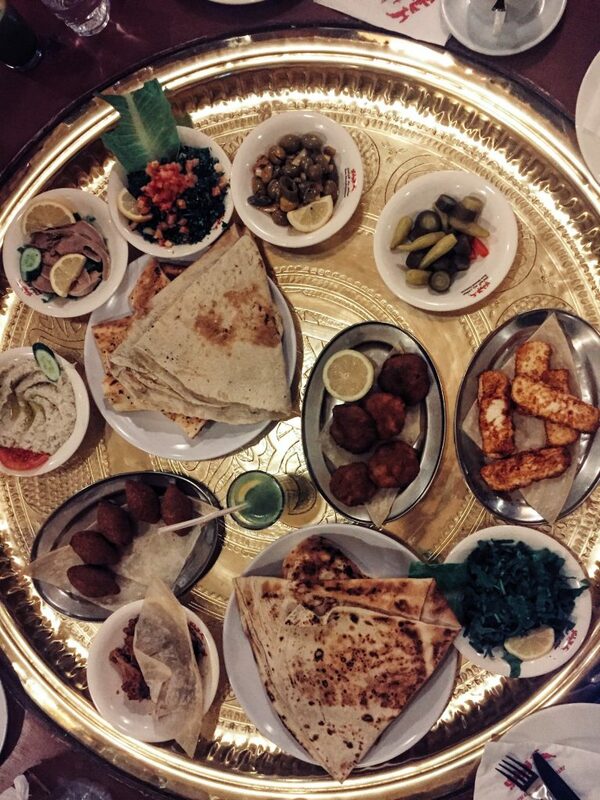 Typical of restaurants in Jordan, the food was brought out very quickly and placed on this incredibly lovely and luxe gold platter in the center of our table, which was nestled under a bedouin-style tent. I also finally got to enjoy some hot mint tea and even mint lemonade with my meal, though was disappointed to discover that both were way too sweet for me. Expect that in Jordan, I guess! 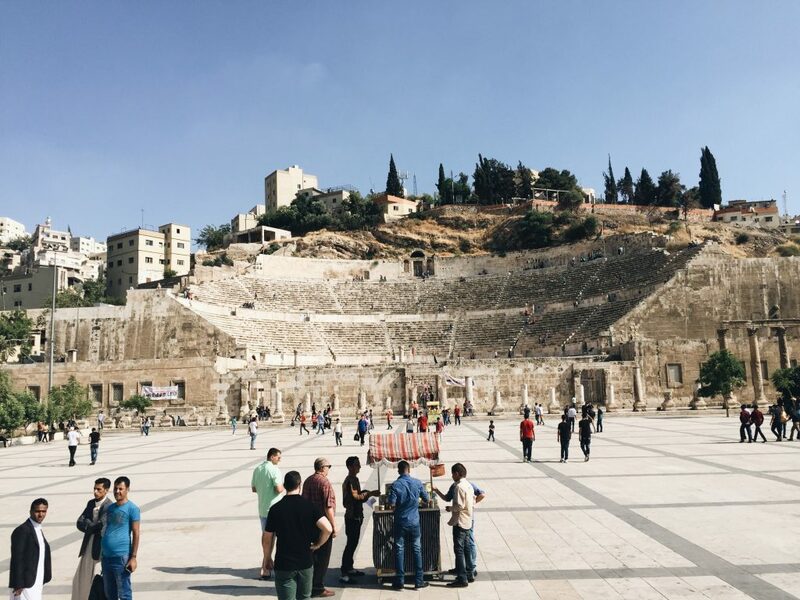 In just one day in Jordan’s capital, you can experience its history and culture, do a little shopping, and sample some of its incredible and traditional cuisine. 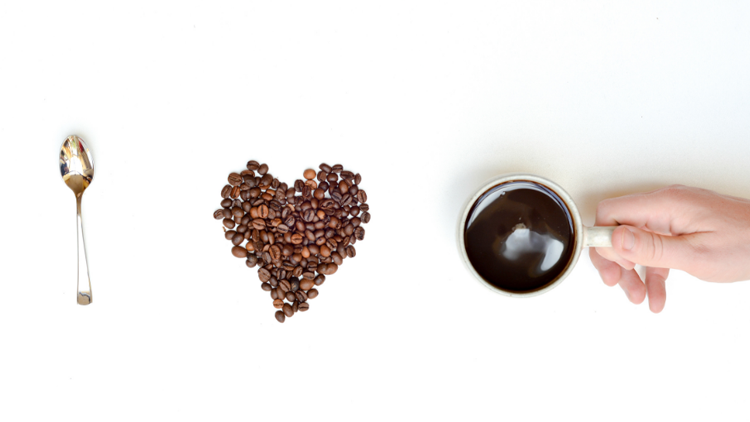 We most definitely went to bed with full bellies and even fuller hearts. 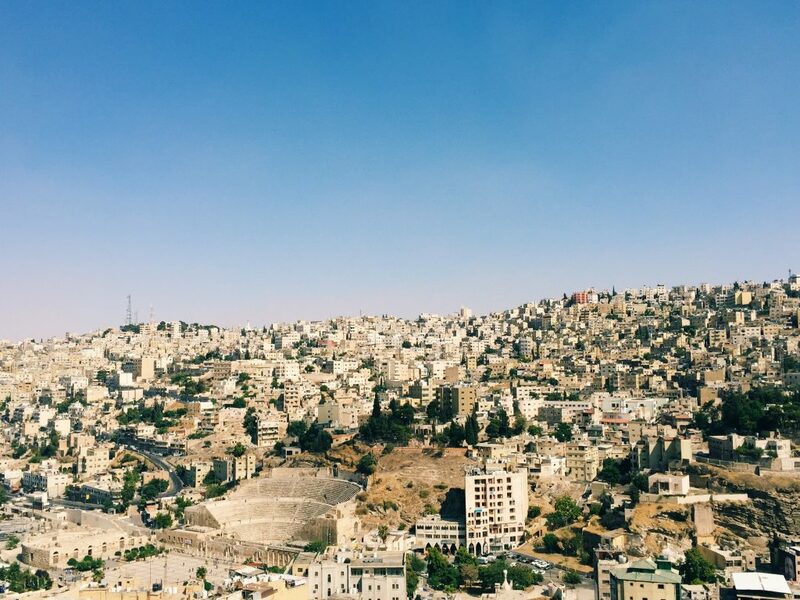 Amman, I like you a lot. 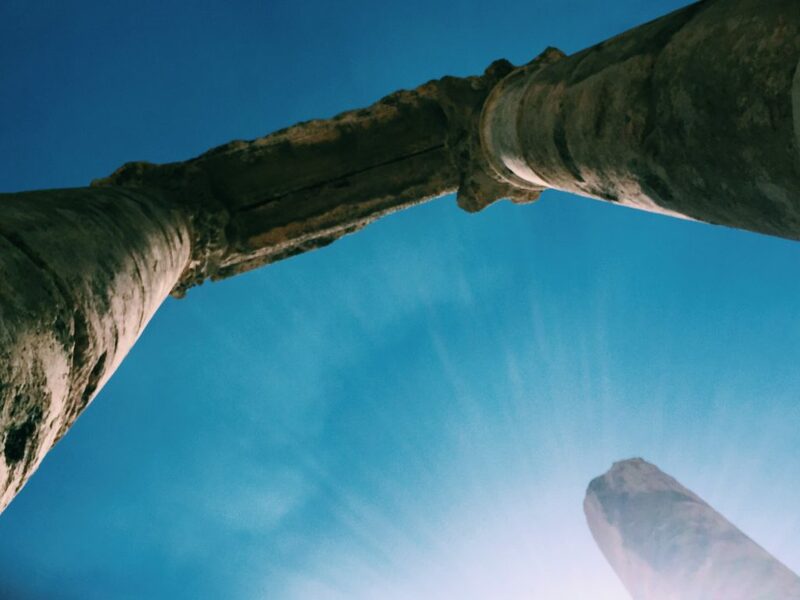 Up next, we’ll be sharing more from our trip to Jordan, including our visits to the Dead Sea, Petra, Wadi Rum, and Aqaba. Please bookmark our blog and follow us on Facebook and Instagram! I’ve done enough juice cleanses to say I’m finished with juice cleanses for a long time. However, I can’t help but still love to make a refreshing green smoothie to enjoy first thing in the morning. Some nutritionists say that lemon and ginger can have some digestive benefits, and who can deny that even just the smell of ginger is so energizing. 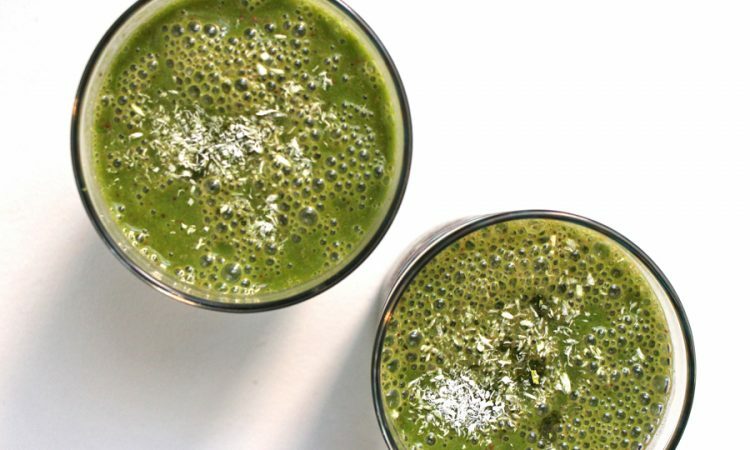 But together, the flavor combination can be a little hard to swallow, which is why enjoying it in a smoothie can really help you reap the benefits and actually enjoy doing it. 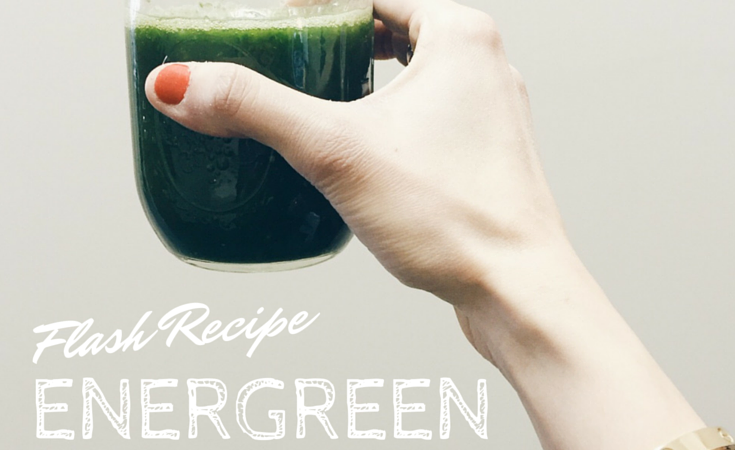 For a dose of greens and energy, here is a recipe for an smoothie we’re loving this week and calling the Energreen Smoothie – you can make it in a flash!